Britannia has an established history with the United Kingdom and has featured on coinage as the embodiment of the nation she represents ever since the Romans invaded the Isles almost 2,000 years ago. During this time, The Britannia design first appeared on the Roman coins of Emperor Hadrian AD 119 and was later revived and added to the coinage of Charles II in the late 17th century. Britannia coins were first added to The Royal Mint’s Bullion range in 1987 and the design was revived and updated by Philip Nathan. His interpretation of Britannia was perfect for the new Bullion coins, presenting an icon with a strong maritime influence. In this design, she stands windswept in a classical gown, with waves at her feet and the classic trident, shield and olive branch in her hand. This modern face of British bullion coins still stands on the Britannia coin as an enduring symbol of strength and tradition and today, over 30 years after it was introduced, marks one of the flagship coins of The Royal Mint. Starting in 2018, The Britannia design was struck on a 1 oz Britannia Platinum coin. Available in 999.5 pure platinum. This was the first ever platinum Britannia coin from The Royal Mint and offered investors an exciting opportunity to diversify their precious metal portfolio into platinum. 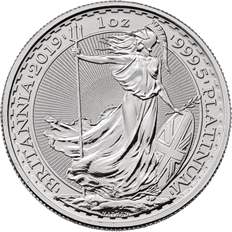 The Britannia Platinum coin is UK legal tender with a face value of £100 and is capital gains tax exempt in the UK. The range of Britannia platinum coins continued to prove popular with investors and was again struck for 2019 to continue the legacy of Britannia.